Healthcare is in the midst of a digital transformation, with recent research pointing to growth in the use of mobile technology in patient care. From healthcare applications to biosensors and other medical devices connected to the Internet, so much more patient data is both mobile and digital, which present challenges and opportunities for both patients and healthcare providers. 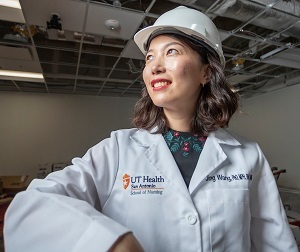 To address these challenges Dr. Jing Wang, Ph.D., M.P.H., M.S.N, RN, FAAN, has joined UT Health San Antonio as the School of Nursing vice dean for research and founding director of the inter-professional Center on Smart and Connected Health Technologies (CSCHT). More focus on smart healthcare reflects the growing concern that too much data can increase the load on healthcare providers, according to Wang, holder of the Hugh Roy Cullen professorship in nursing. Develop the South Texas Connected Health Living Lab to devise solutions for South Texas seniors who are aging in their homes and address digital and health disparities, especially among Hispanic seniors. With patient consent, students will visit them in their homes to understand needs and test connected healthcare sensor devices. Establish a training and simulation center to educate students, faculty, and clinicians on telehealth, connected health, and smart home concepts. CSCHT received support from the Long School of Medicine, School of Nursing, Office of the Vice President for Research, and the Office of the President. Wang plans to work with colleagues across the institution to develop new ways to use technology to improve the lives of patients, particularly those with type 2 diabetes and obesity. The vision for the new center is to complement the education and training provided in the nursing school’s Center for Simulation Innovation (CSI). Plans include spaces set up to simulate a primary care visit and hospital visit as well as a patient’s home to test how technologies used in these three areas can help patients transition better across the continuum of care. CSCHT will have limited spaces for setting up clinical areas, so Wang will focus on designing a home environment embedded with sensors for hands-on training on how these technologies connect with healthcare providers. She plans to leverage CSI’s simulated clinic to test ideas for the improved patient transition from a hospital stay [as simulated in CSI] to back home [at CSCHT]. Wang will also draw on the city’s strengths—area universities, healthcare providers, and private industry— to build a regional inter-professional hub. The center plans to seek strategic partnerships with industry leaders by capitalizing on the private sector’s success in technology. "Dr Wang’s new Center will create opportunities for innovation in addressing health solutions for individuals as they age in place and manage chronic disease. This is the first such Center in a Nursing School, setting a national model."